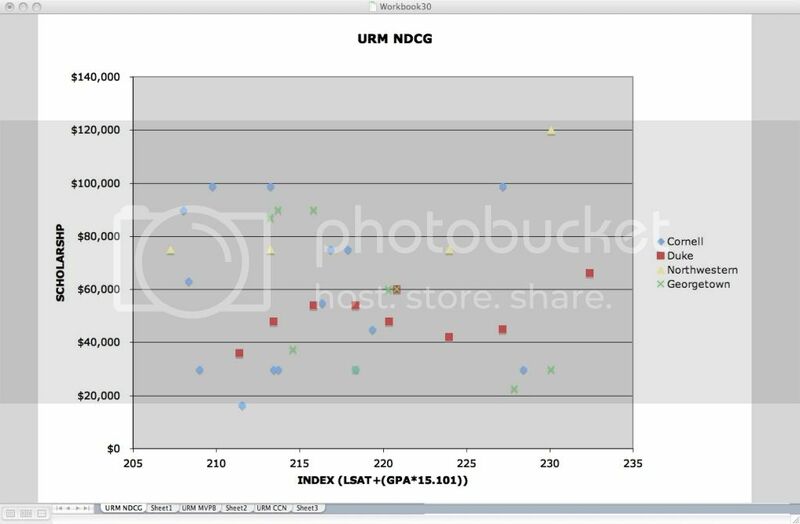 Graphs based on index averaged from all published t14 indexes. 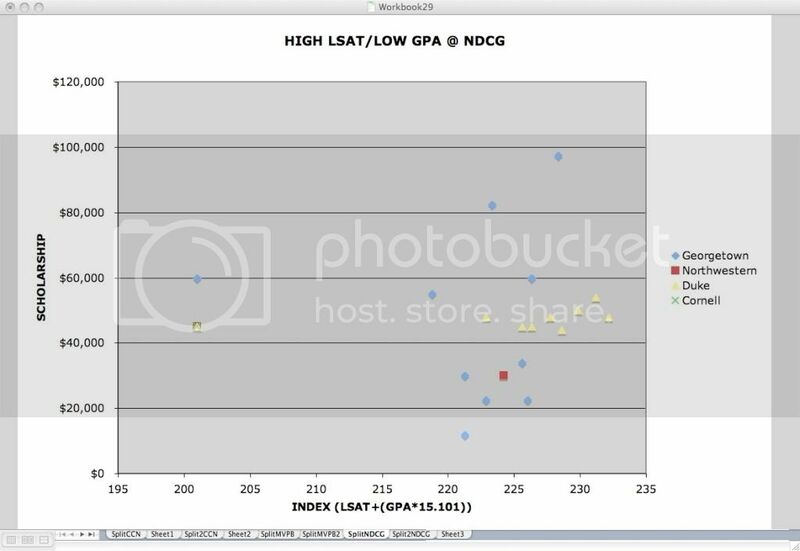 To calculate your index take LSAT+(GPA*15.101). 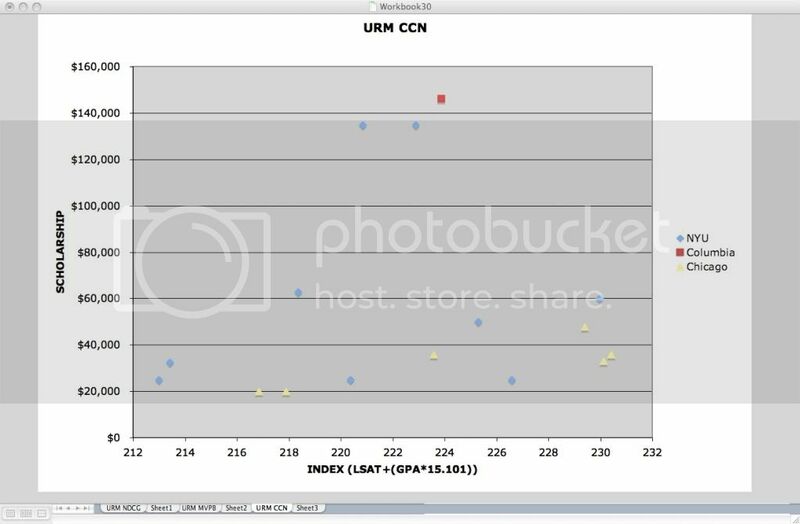 Major outliers are assumed to be cancer curers or non-reported URMs (or both). Additionally, figures represent only reported offers, which is often a first offer refused by a withdrawing candidate who made no attempt to have that figure raised. Thank you to YCrevolution for help with the average index! Following summary graph provided by jackassjim. many thanks! Use the schools above number (1-22) for reference. Includes only those applicants with one number at or above the schools 75th percentile and the other at or below their 25th percentile who reported receiving merit aid offers. The more data points a school has, the more splitter friendly that school was last cycle. 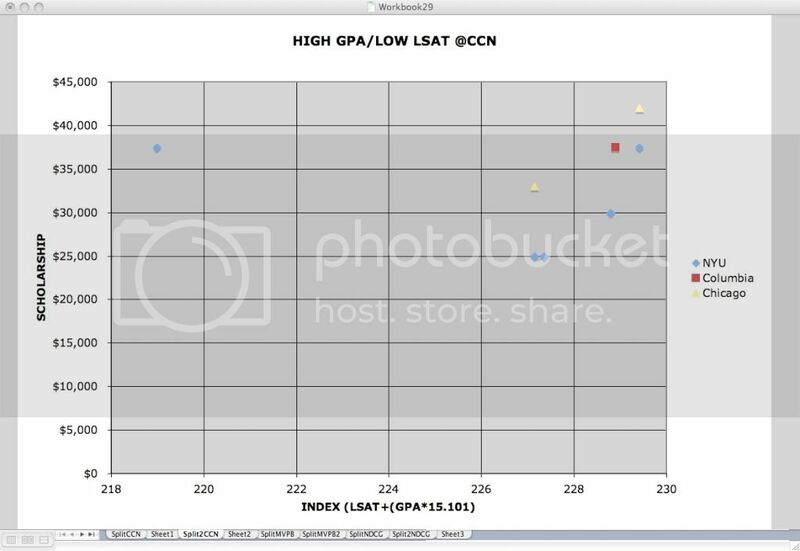 Calculate your INDEX by adding your LSAT score to your GPA*15.101. 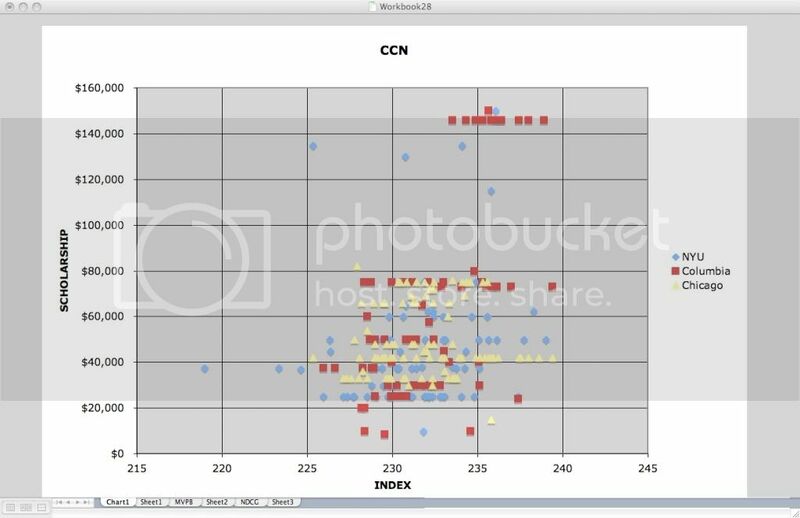 Go to the graphs that fit your splitterness to see how much money, if any, to shoot for. Last edited by Chuch on Wed Dec 02, 2009 11:19 am, edited 28 times in total. Thanks for the excellent submission. 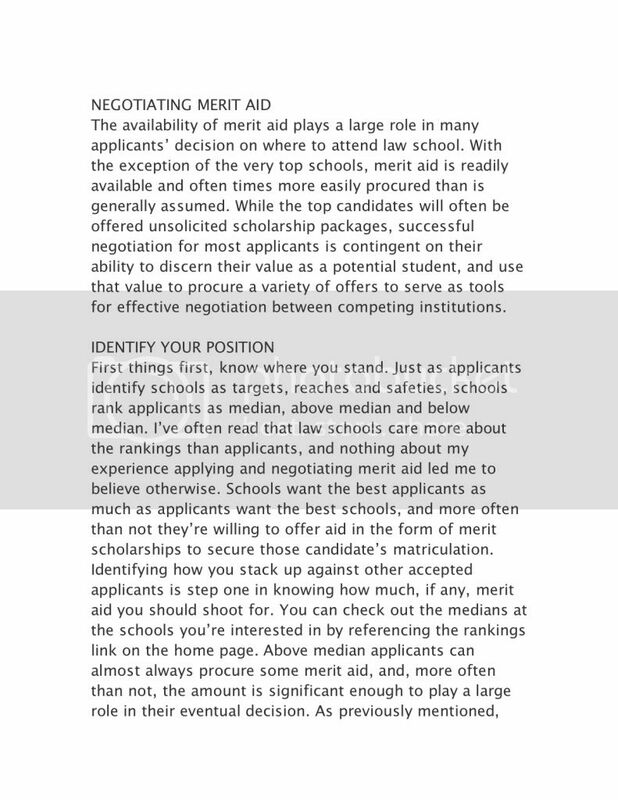 The question of how to negotiate merit aid offers and scholarships is frequently asked and your article will surely be a resource to address this FAQ. Great article! This is amazing! Do you have any suggestions for how to identify a splitter's position? 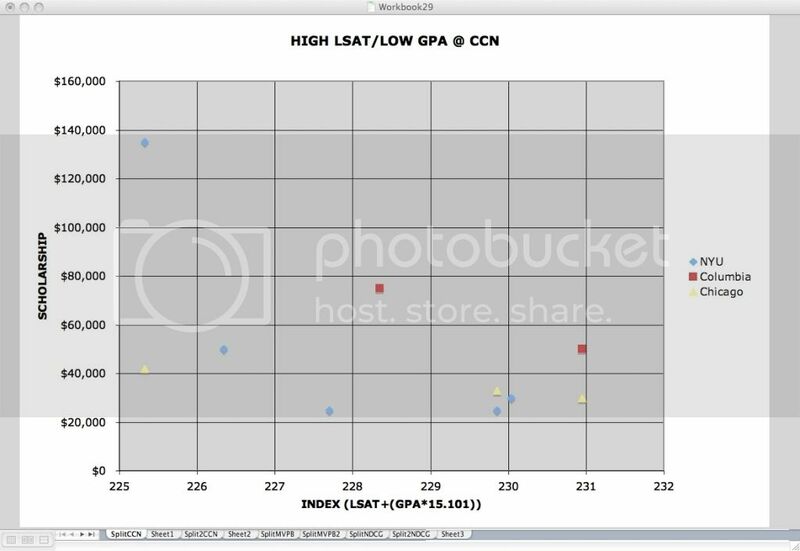 I am a 3.2/171 so for most of my "target" schools, I am above median LSAT and below median GPA. Katerina wrote: This is amazing! Do you have any suggestions for how to identify a splitter's position? I am a 3.2/171 so for most of my "target" schools, I am above median LSAT and below median GPA. 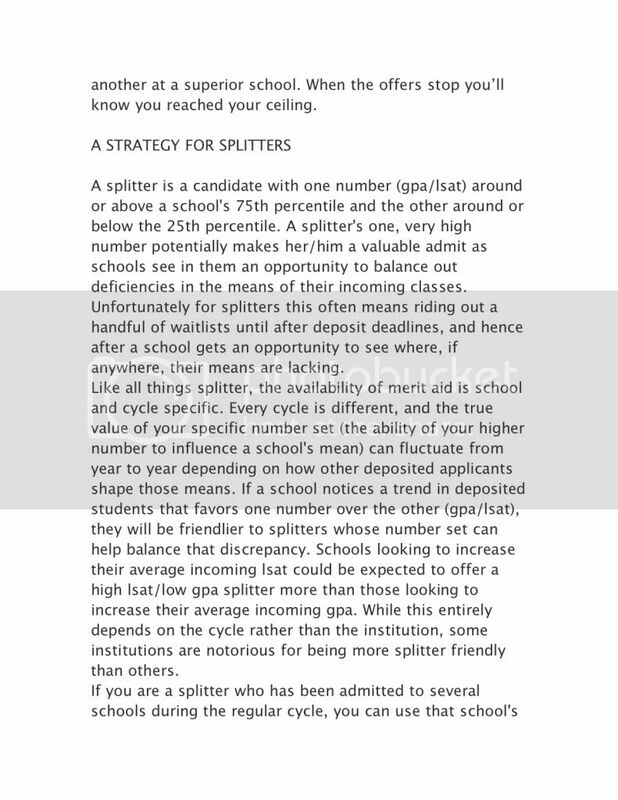 I really think splitter treatment depends on the school and is somewhat unpredictable. 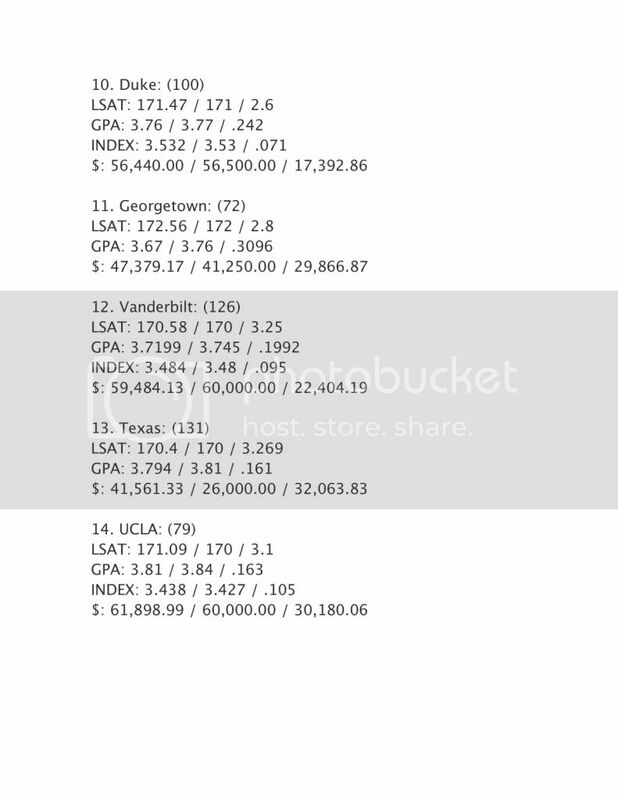 I had a 3.1/174 and received merit aid from Michigan, Cornell, and GULC but none from Penn and Northwestern. There are a number of splitters w/merit aid from Michigan on LSN. 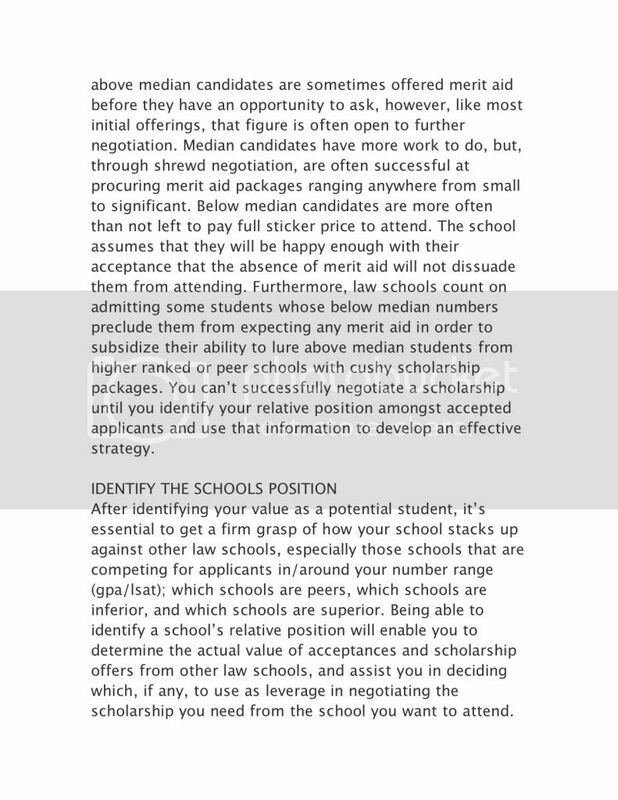 this is definitely true as merit aid in general depends on the school and the cycle, and many non-splitter, above median applicants have noted inconsistencies in merit offers from peer schools. 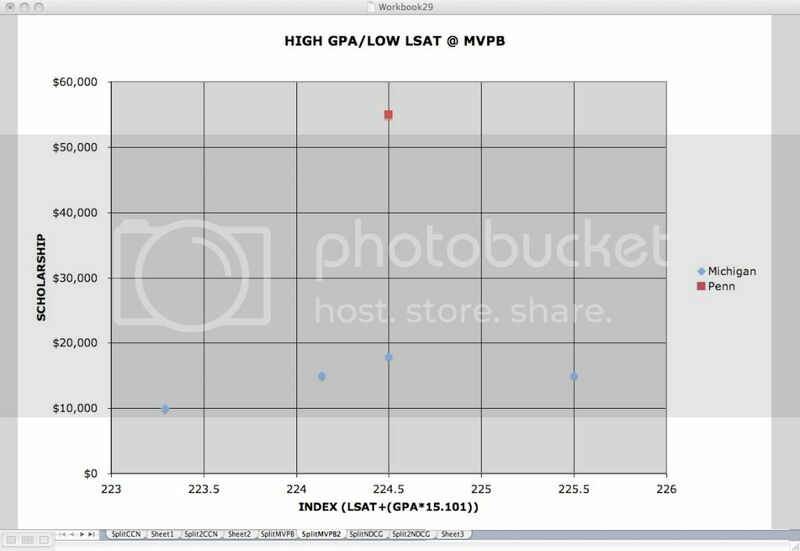 i would assume that the level of predictability decreases as your numbers separate and it becomes harder to identify where you stand relative to a school's median. 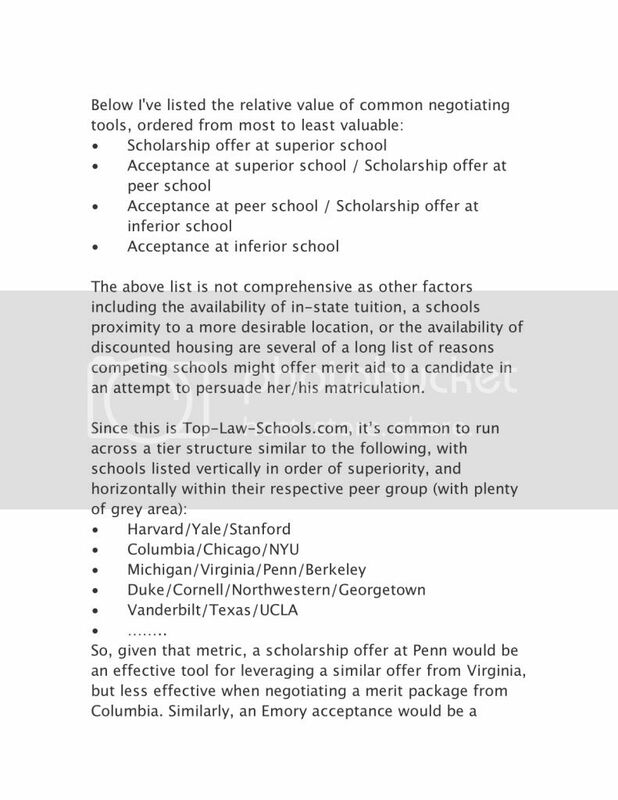 additionally, variance of competing offers within their respective tiers will probably increase as peer schools attempt to balance their incoming classes; in other words, if a school notices a trend in deposited students that favors one number over the other (gpa/lsat), they would probably be friendlier to splitters whose number set could help balance that discrepancy. 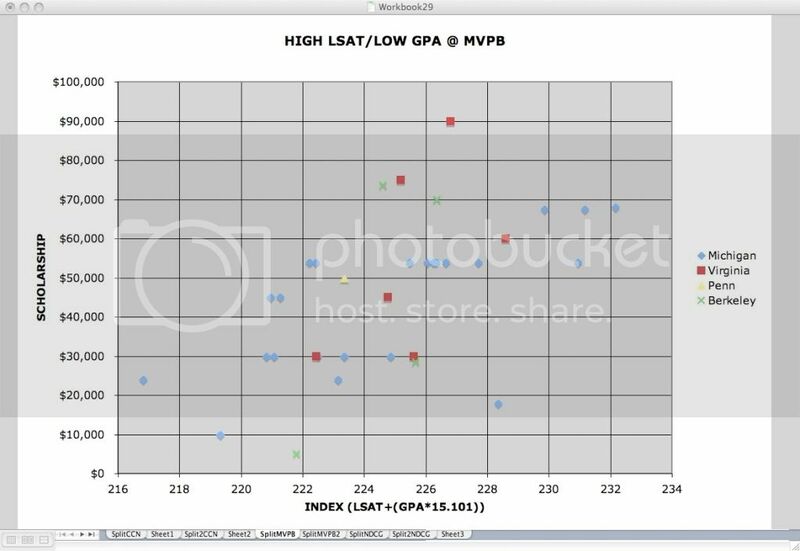 schools looking to increase their average incoming lsat could be expected to offer you more than those looking to increase their average incoming gpa. that would entirely depend on the cycle rather than the institution. Last edited by Chuch on Sat Jul 18, 2009 12:18 pm, edited 1 time in total. Thanks Chuch, your excellent article is already helping TLSers. Ken wrote: Thanks Chuch, your excellent article is already helping TLSers. GULC - received no offer. Inquired about merit aid with no mention of other offers and received $5K/yr scholarship. A couple days before the scholarship acceptance deadline I received an unsolicited email upping it to $10K/yr. Michigan - received $15K/yr offer. Requested an increase w/no leverage. Denied. 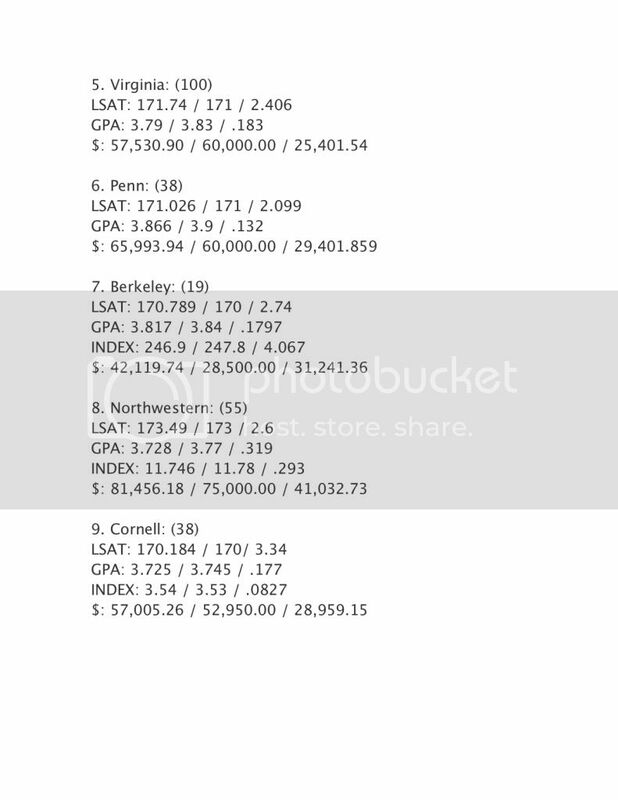 Cornell - received $10K/yr offer. Showed then Michigan's offer and received increase to $15K/yr. I politely pointed out that Michigan would have a significantly lower COA with equivalent scholarships. They didn't budge. Northwestern - no offer. Inquired about merit aid. 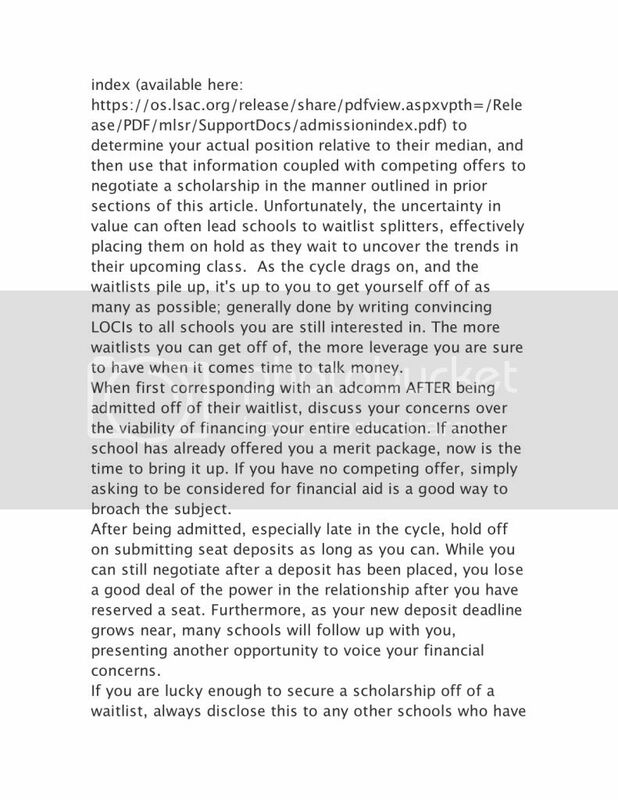 Denied, but told to wait until first round of scholarship acceptance deadlines passed. Asked to submit offer letters from UM & Cornell which I did. Denied again. Penn - got in off Hold, in late April. Inquired about merit aid. They asked for pdf's of my UM offer letter, I sent. Denied. Michigan is close to being my top choice (Duke/NU my other top choices) because of their summer-start (in addition to, you know, being a good school). I'm not going to ED because $65k/year is a way too much to take on in loans (esp. @ 8.5%). 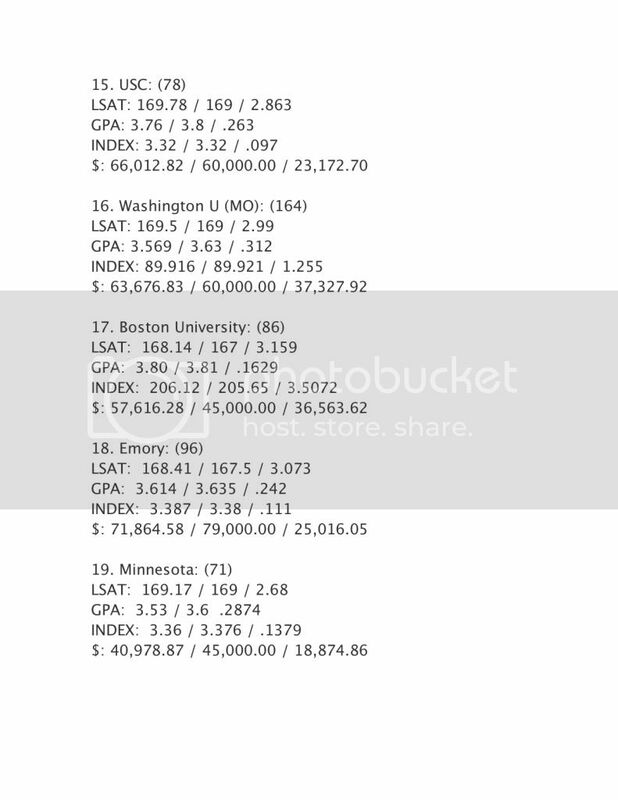 If I can get my firm to shovel me 5-10 hours of patent prosecution work during the year (no overhead and my low billing rate should be attractive), then I'd commit to Michigan the second they hit $15k/yr in scholarship money (which would keep my in Stafford Loan territory for the three years). Assuming I'm lucky enough to get an acceptance, can I actually be this direct? At $15k/yr, I'm attending (no ifs or buts)? I think it should be added to the top of the article - APPLY BROADLY. Everyone always says to select a "few" reaches and targets. But, especially if you can get fee waivers, it's worth the investment (only $12/app with a waiver) to get as much leverage as possible. 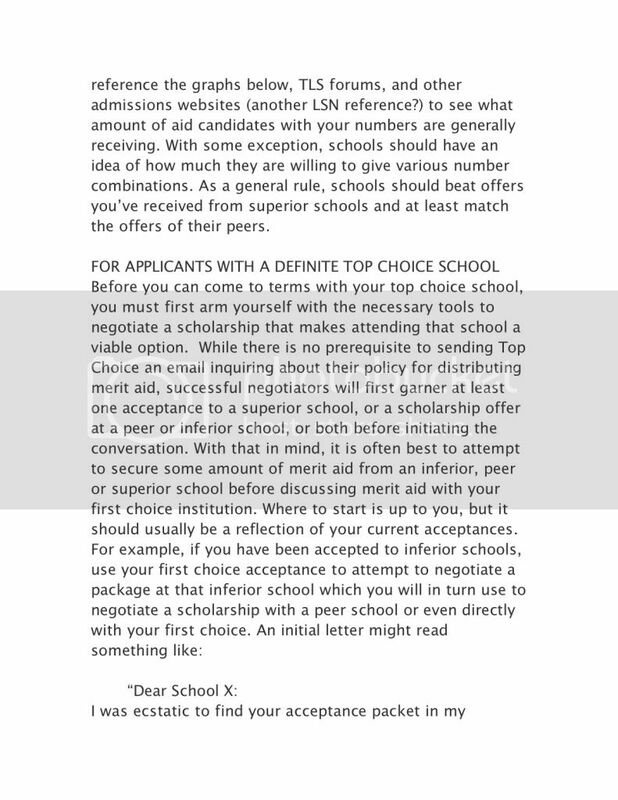 So, even if a school might not be in a region where you want to practice, or even if it's a T14 you wouldn't want to attend due to location (like Michigan or Cornell), it's still worth applying and taking the time to write supplemental essays, etc. It's worth it for potentially $10-20K more. As for negotiation style, do you really have to worry too much about how you phrase it? I didn't do that much negotiation, but I was successful just saying "I really want to go to this school but I'd like you to please consider other offers of $X from School Y and, etc." and I just emailed them scanned copies of award letters. Don't lowball yourself at $15K/yr. That's what I got with worse numbers, and IIRC an "easier" engineering major. Let them send the initial offer. 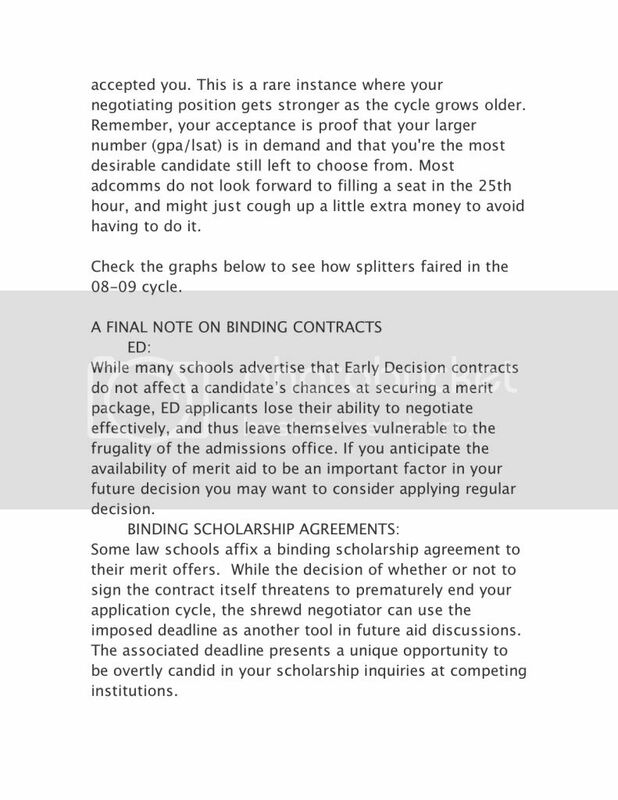 that was a great (albeit condensed) example of how the negotiation process might go for applicants at every level. 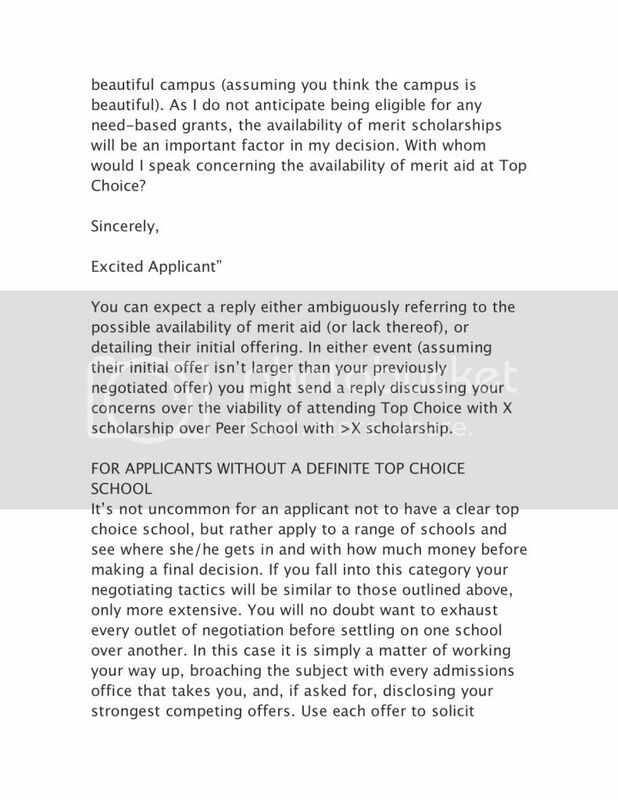 rondemarino wrote: Assuming I'm lucky enough to get an acceptance, can I actually be this direct? At $15k/yr, I'm attending (no ifs or buts)? you can still be that direct without sounding quite as entitled. personally, i wouldn't name an exact figure or include the ultimatum, but there certainly isn't anything wrong with emailing to discuss your financial situation as it relates to the viability of your matriculation. sbalive wrote: I think it should be added to the top of the article - APPLY BROADLY. good advice. 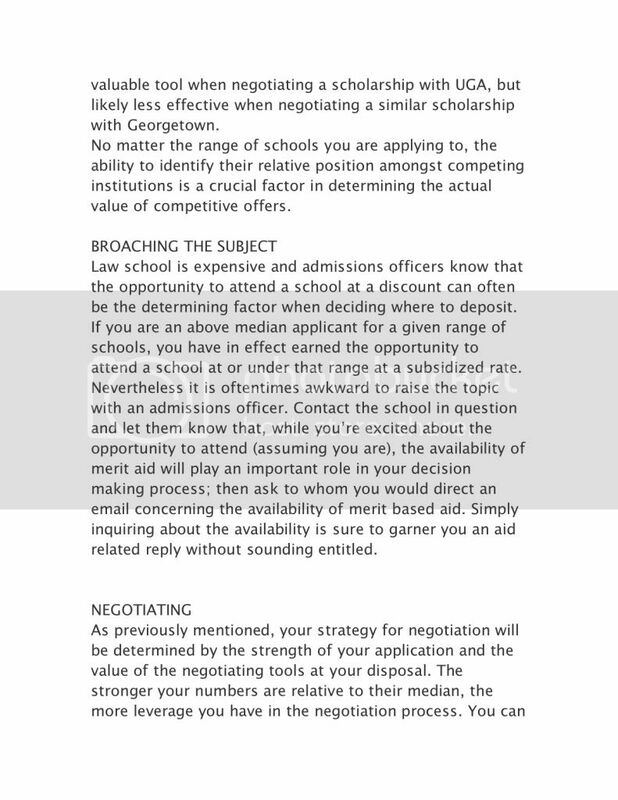 applying to more schools increases your chance at picking up those valuable negotiating chips outlined above. you really can't have too many options. 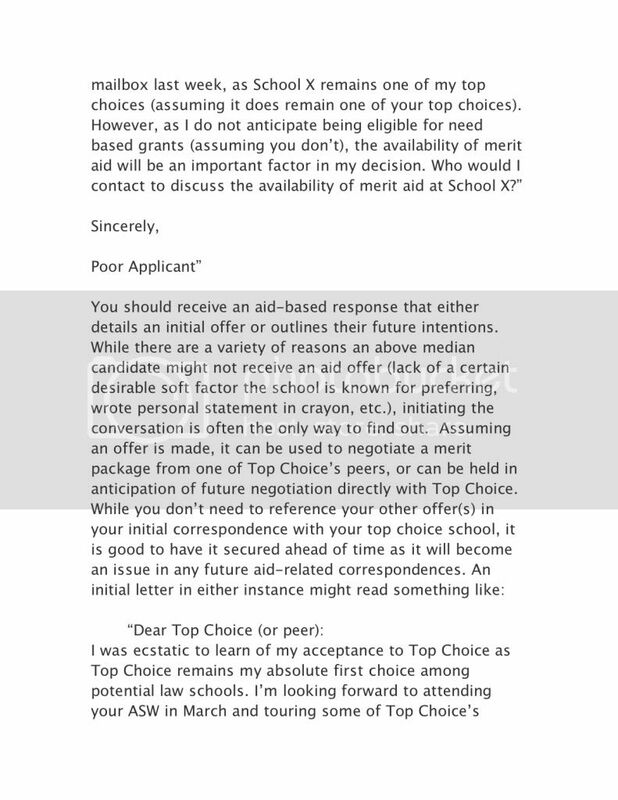 it actually sounds like you phrased your aid-related correspondences quite well, and, even if it didn't feel like it at the time, emailing them copies of competing award letters is a great example of the negotiation i talked about in the article. the assumption is that they often base their offers off of the existence and amount of competing offers rather than just offering a scholarship to everyone who deserves one. Aeroplane wrote: Don't lowball yourself at $15K/yr. That's what I got with worse numbers, and IIRC an "easier" engineering major. Let them send the initial offer. I guess I wasn't terribly precise in my post, but I meant giving them a number after the initial offer. Is naming my price after their first offer a good idea? TO Chuch: I don't feel entitled, so I'm really not hoping to sound entitled (but its something I'll now make an effort to look for, in case I come off that way). 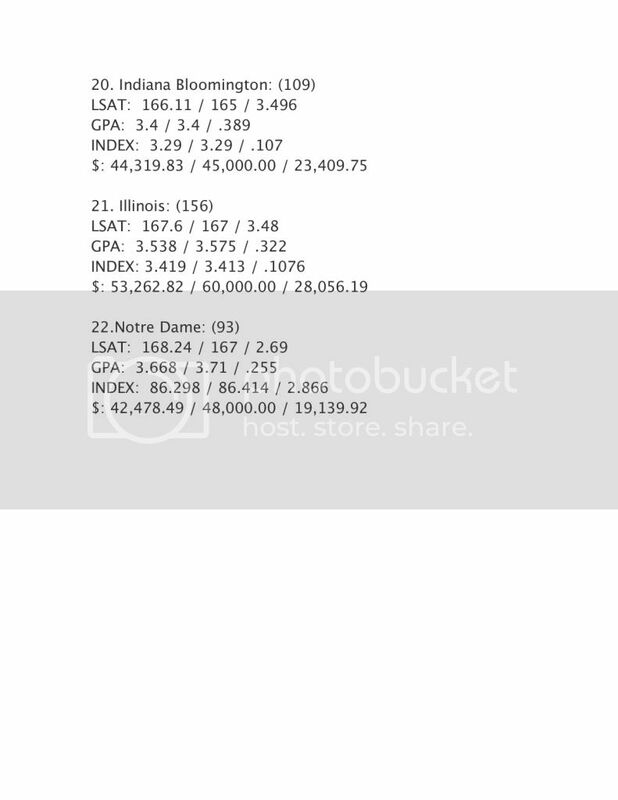 MY estimates are based on my financial situation only, and nothing else. rondemarino wrote: TO Chuch: I don't feel entitled, so I'm really not hoping to sound entitled (but its something I'll now make an effort to look for, in case I come off that way). MY estimates are based on my financial situation only, and nothing else. didn't mean to suggest that you felt entitled, but naming your price in an ultimatum has the potential to rub an adcomm the wrong way. i'd stick with the tactics aeroplane outlined where simply asking them to make their offer more competitive with those of their peers is your go-to counter. added stats for the t14. let me know other schools people would like to see stats for. 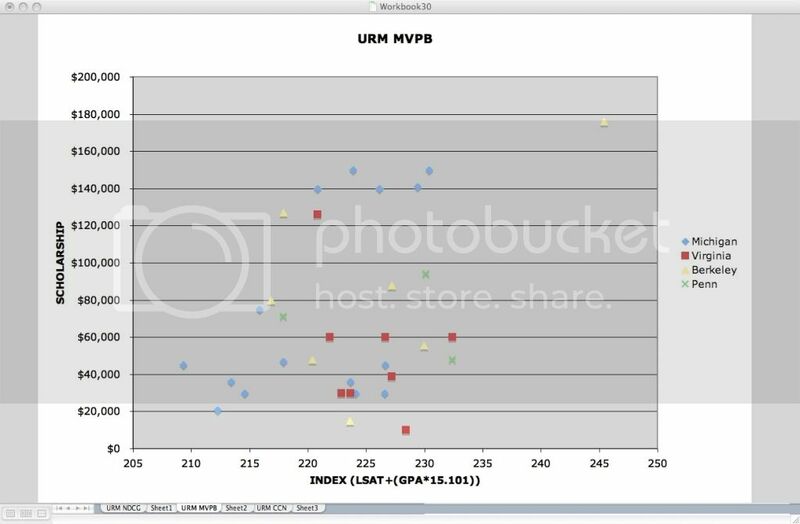 urm stats will follow for all school with sufficient sample sizes. Chuch wrote: added stats for the t14. let me know other schools people would like to see stats for. 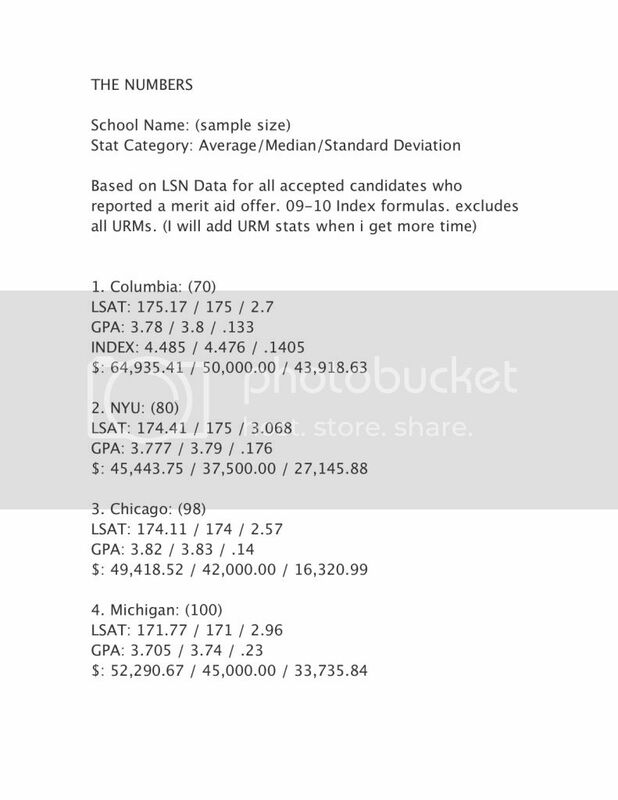 urm stats will follow for all school with sufficient sample sizes. on the way. should be up by tomorrow. That's really great. Thanks for being thorough and including both mean and median, as well as the SD. This is really informative! done. go get that $$$. Way to make a very good article to become great. I appreciate your taking the feedback from others and incorporating it into expanding the article. 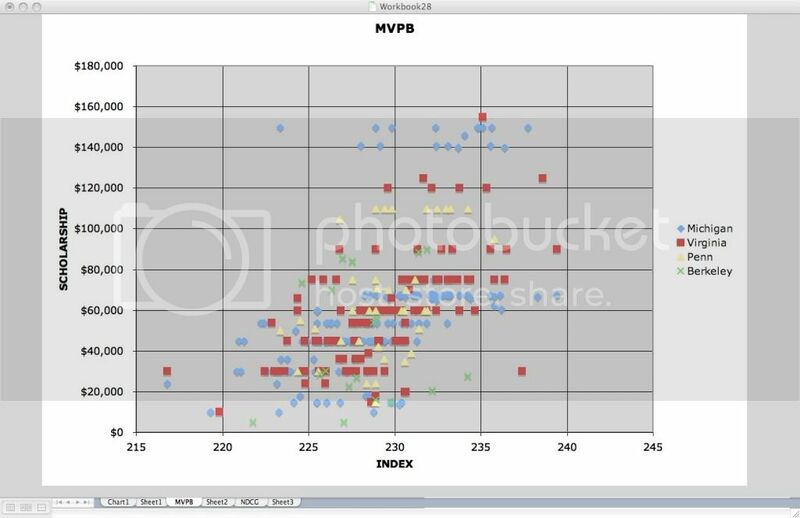 Could someone with more excel skillz than I graph those out? Perhaps by the ranking groupings further up in the text? 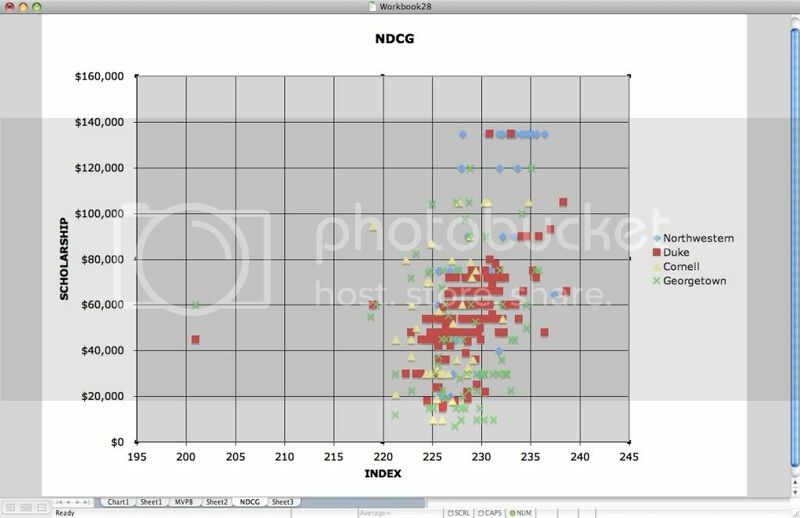 Yimbeezy wrote: Could someone with more excel skillz than I graph those out? Your data for Michigan and Virginia are incomplete. Sample size should be considerably bigger. jackassjim wrote: Your data for Michigan and Virginia are incomplete. Sample size should be considerably bigger. yeah. i only grabbed first page of search results (hence the even 100). i'm working on updating it now.